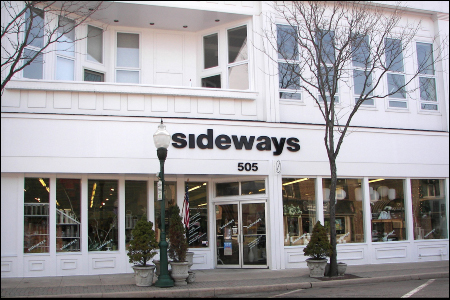 contact us at sideways in Plymouth MI unique merchandise at a good value. where eclectic meets elegant - unique merchandise at a good value. We are only closed on traditional holidays. sideways stocks home decor items, kitchen ware, cook ware and cooking utensils, gifts for all occasions, unique home accents, root candles, cards, gift wrap, seasonal gifts and decor, paper goods, delicious pantry items, gourmet foods, tea's and coffee's.